(Illustration from Free Bible Images) «Then the king burst into tears, and went up to his room wailing, ‘O my son Absalom, my son, my son Absalom. If only I could have died for you! O Absalom, my son, my son’» (2Samuel 18:33). As people heard of the king’s deep grief for his son, the joy of victory was turned into deep sadness. David later returned to Jerusalem to reign as King of Israel once more. I conveyed that revenge is never the way of a true father. That was almost three years ago, and I am even more convinced today. Although I have been backstabbed, again and again. The pain that I personally learned of firsthand from Rev Øyvind Fragell (1914-1993) over the incessant betrayal by his own son, gave me insight that has helped me to understand. When the time came for God to intervene, King David covered his face, and cried with a loud voice: «O my son Absalom, O Absalom, my son, my son!» (2Samuel 19:4). A true father will always love his son and daughter. There is always hope. The cover of one of Rev. Øyvind Fragell´s albums. In 1975 – when I was 17 – I met Rev. Øyvind Fragell (1914-1993) for the first time. He was a beloved minister in Norway´s Pentecostal Movement who wrote some of the most heart-warming and tender songs about our relationship with Jesus Christ. I will never forget that conversation in 1975 which happened openly in the lunch room of the Filadelfia Church and Publishing House. Fragell had heard that I had come back to Jesus after 1 1/2 years of being away from the Lord. I had sought guidance in the Humanist Association. The meaningless and empty lives that I encountered there threw me into a despair so deep that I finally fled – back home to a life with Christ! I have followed Christ faithfully ever since. Rev. Fragell shed tears of gratitude when he heard my story. But he also sobbed deeply when he told the painful and tragic story of how his own loved ones had left and betrayed the Lord. I learned from Rev. Øyvind Fragell that betrayal of the Lord is a terrible thing. Don’t let anyone fool you into thinking that he was happy and content with that. His despair and tears speak today – 25 years after his death. Aina & I have been seeking God together today on May 1st, and God has spoken to us about today marking the beginning of the next phase of our life and ministry. May 1st is a day to say farewell to winter, and marks the beginning of springtime fertility. It is a celebration of things coming to life. God is affirming the created purpose He has for us and that we are destined to prosper! The specifics are for us to pray and follow-through! This is a Word with promise for many! Screenshot from a video I produced when Levi Fragell was speaking in Oslo earlier this year. I am somewhat amused by some of the severe criticism of me from the waning and almost obsolete anti-Christian, aggressive secular humanist group in Norway, connected to the Norwegian Humanist Association. They are being pumped on a daily basis by their former leader (1976-1990), Levi Fragell, the 77 year old backslidden pentecostal preacher boy who almost 55 years ago left his father Øyvind Fragell´s vibrant faith to instead live a life committed to oppose great men of God such as the evangelists Aril Edvardsen and Emanuel Minos, and for the past 6 1/2 years against me. His warm-hearted preacher father cried in despair when I interviewed him as a young journalist in the mid-1970´s. RIP, Øyvind Fragell! Levi Fragell´s rage has been so massive that he even followed Aril Edvardsen on a crusade in India, just to prove that the great evangelist was a fraud! His rage against me has increased, almost feverishly, as he has seen the blessing that God has heaped upon Aina & me during the past 6 1/2 years. In 2011, Levi Fragell demanded triumphantly in the secular-Christian newspaper Vårt Land that I had to resign as a pastor! Instead, God has promoted us in Norway and worldwide. My tv programs are supported and watched by the high and low in our nation. I am summoned into meetings with leaders of Norway, Europe, and beyond. The most interesting thing about this Fragell-based criticism is that it attacks classic Christianity, both catholic, orthodox, protestant, evangelical, and charismatic-pentecostal: 1) The Bible as the authoritative Word of God. 2) Jesus as the only Way to God. 3) Conversion unto Christ. 4) The two outcomes of life: Heaven or hell. 5) The reality of angels and demons. 6) Healing of the sick. 7) Speaking in tongues. 8) Ministry unto children. 9) The gospel as an integral part of a Christian home. Etc, etc, etc. The bottom line for the aging Fragell is his hatred of God. I participated in a meeting with him earlier this year in Oslo, and there he denied that he had ever said he hates God. But afterwards he had to admit it, because it is written explicitly in his autobiography from 2010. I hope and pray that Levi Fragell will find peace at this late stage in his life. You might have heard of “Eidsvolds Plass”, the round, park-like place in front of the two lion-statues that guard the main entrance to “Stortinget” (Parliament) in the beautiful downtown area of Oslo. This is the place where almost daily demonstrations are being held – for or against every issue on Planet Earth. The megaphones and posters aim at catching the attention of the 169 elected members of Parliament. Personally, through more than 25 years, I have initiated and spoken at rallies on wide-ranging topics as abortion, homosexuality, marriage, family, prayer for Norway, re-Christianization, elections, democracy, Israel, European Union, Afghanistan, islam, freedom of speech, religious liberty, barnevernet, refugees, migrancy & more. Some have brought change, and others have been forgotten, but we have fought – and hoped. This photo of the original Grunnloven of 1814 hangs on the wall of my office in Oslo, beautifully framed. “Eidsvold” is more an ideal than a geographical place. That is why some of us chant on May 17th (the day when we celebrate our Constitution): “1814 shall still live”, or “Eidsvold shall still live”. What makes “Grunnloven” an excellent foundation for the modern Kingdom of Norway 203 years after it was written? Paragraph 1 declares that “the Kingdom of Norway is a free, independent, undividable, and indefeasable kingdom”. 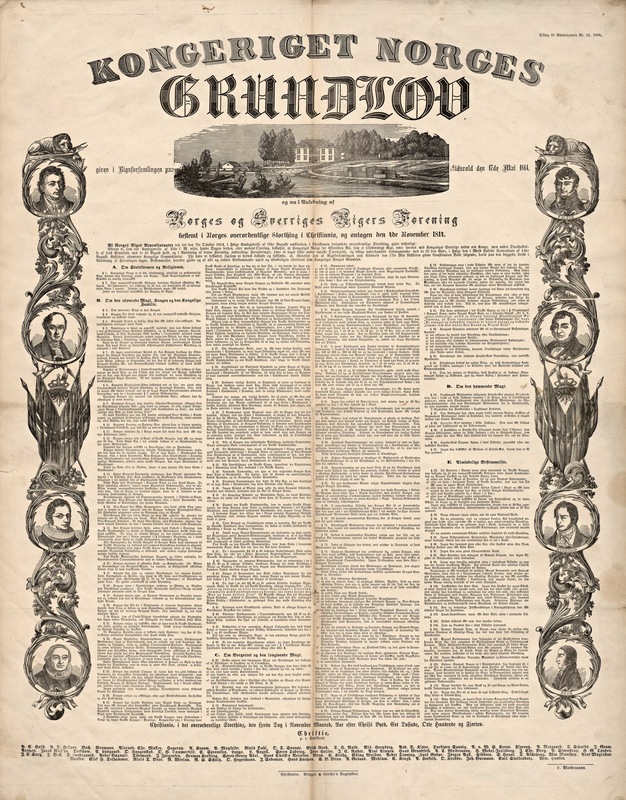 “The Eidsvold Men” were visionary during the turbulence between European mega-powers in 1814 to include our Declaration of Independence in Grunnloven. The kings of Sweden and Denmark got the clear message that we want our independence! One may ask: How can a Kingdom with such excellent “ground rules” develop such an undemocratic institution such as barnevernet? That actually destabilizes and dissolves the family unit at its most vulnerable moments, and at times leading to lifelong psychological problems for children? Even leading to suicide…. But the problem is really with “a sleeping beauty” called the Church which has become tolerant and compromising with limited commitment to wage the spiritual and ideological wars of our nation. While media and academia have worked ferociously to undermine the “ground rules” of Grunnloven. We need the same visionary power of the 169 “Eidsvold Men” of 1814. 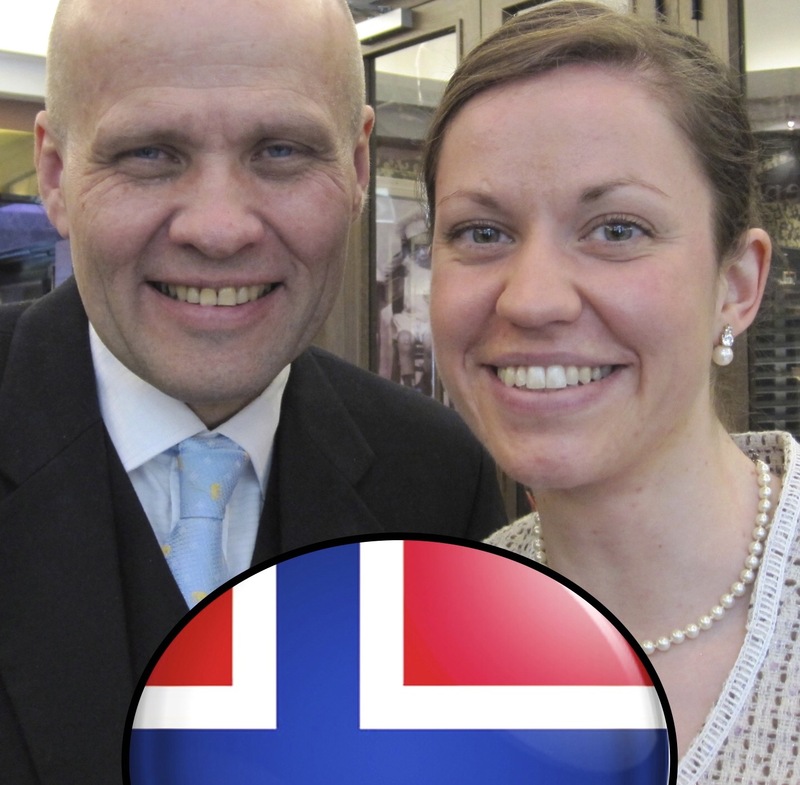 Liberal Christianity has taken control of the state-financed Church of Norway. It is no exaggeration to say that the official Church of Norway is 100 percent pro-LGBT (pro-Lesbian/Gay/Bisexual/Transsexual). The next change will be a massive turning away even from heterosexual marriage. We will see multiple-marriages (3 or more marriage partners), marriages with non-humans (dogs, items of affection) etc. The list is long, and it is coming – full fledge. The biggest European atheist brainwashing experiment that has ever been attempted. It failed!